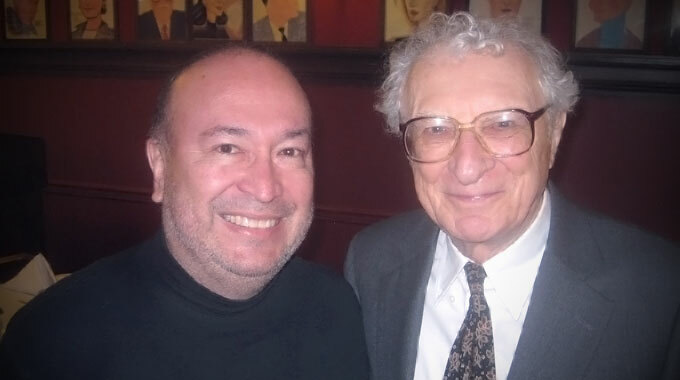 Broadway legend, lyricist Sheldon Harnick (pictured above) will receive a Special Tony Award for Lifetime Achievement at this year’s ceremony. Harnick, who turned 92 this past April 30th, has two of his musicals running on Broadway this season. Broadway legend, lyricist Sheldon Harnick (pictured above) will receive a Special Tony Award for Lifetime Achievement at this year’s ceremony. Harnick, who turned 92 this past April 30th, has two of his musicals running on Broadway this season. Both shows, written with composer Jerry Bock are nominated for Best Revival of a Musical: Fiddler on the Roof and She Loves Me. Harnick and Bock are also the authors of the Broadway classics Fiorello (1960 Pulitzer Prize for Drama), The Apple Tree (1966), and The Rothschilds (1970). The Tony Awards ceremony will held on Sunday June 12th at 8 p.m. and will be broadcast locally on channel 4. Speaking of classic musicals, Musicalfare concludes its 2015-16 with Andrew Lloyd Webber’s Evita with Michele Benzin in the title role. Directed by Randall Kramer with music direction by Theresa Quinn, the production will also star Marc Sacco as Che, John Fredo as Perón, Paschal Frisina as Magaldi, and Arianne Davidow as The Mistress. The ensemble will feature Taylor Carlson, Jeff Coyle, Thomas Evans, Alejandro Gómez, Jake Hayes, Matt Iwanski, Victoria Perez, Emily Yancey and Jon Yepez. Evita runs July 6th – August 6th. By the way, Lloyd Webber’s new musical School of Rock has been nominated for a Tony Award and his ever-popular Cats is heading back to Broadway in July (a screen adaptation is also in the works). Stratford Festival kicks off its 64th season with a reimagined production of A Chorus Line. Director/choreographer Donna Feore has reconceived the legendary Michael Bennett musical specially for the Festival Theatre space. Previews are now in progress with an opening scheduled for May 31st. The show’s original Cassie, Donna McKechnie, is scheduled to talk about the original production and her career on July 9th at 10:30 a.m. at the Studio Theatre. While the Shaw Festival gets ready for Oscar Wilde’s A Woman of No Importance (May 29th – October 22nd), the Irish Classical Theatre Company will present Wilde’s An Ideal Husband, opening on June 3rd, directed by David Oliver. Up next for Raíces Theatre Company, Desde el Puente, a bilingual one-act play festival starring Victoria Pérez, Rolando Martín Gómez, Smirna Mercedes-Pérez, Dewel Pérez, Steve Brachmann, Ingrid Córdova, Alejandro Gómez and Maria Pérez-Gómez. The production will play May 27th through June 5th at The Manny Fried Playhouse, home of Subversive Theatre Collective. Subversive will open its 2016-17 season with the satirical musical comedy Urinetown, winner of 2002 Tony Awards for Best Book and Best Sore. Beginning on June 9th the company will present the sixth installment in its Subversive Youth Series, Cheryl L. West’s adaptation of Akeelah and the Bee, directed by Kelly M. Beuth. The production will star emerging actors from Buffalo’s Performing Arts High School. West is best known for her plays Before it Hits Home and Jar the Floor. Planning somewhat in advance, the New Phoenix Theatre will open its 2017-18 season (yes, in September 2017) with the divine Anne Gayley starring in Israel Horovitz’s play My Old Lady, to be directed by Michael Lodick. The play was recently (2014) made into a movie starring Maggie Smith and Kevin Klein. Plans are also in the works for a movie version of the solo play Grounded, which was performed in spring 2015 at the Public Theater in New York, starring Anne Hathaway. She is producing the movie and is also expected to star in it. The play is about a female fighter pilot in the Middle East who has to end her career due to an unexpected pregnancy. The Kavinoky has Grounded as part of its 2016-17 season, starring Aleks Malejs, and directed by Kristen Tripp Kelley. Incidentally, working the other way, from movie to stage, Stratford is presenting the North American premiere of Shakespeare in Love, the stage version of the Oscar-winning film. After a very successful capital campaign for a new stage, Shakespeare in Delaware Park will break ground this week in preparation for the new stage installation, which begins on May 16th. The season begins on June 23rd with The Winter’s Tale, which was the company’s first production in 1976 and will now be the first production on the new stage in 2016. Some business news. Theatre of Youth has received a $50,000 grant from The John R. Oshei Foundation for general operations support. Road Less Traveled has appointed John Hurley in the full-time position of Associate Artistic Director.